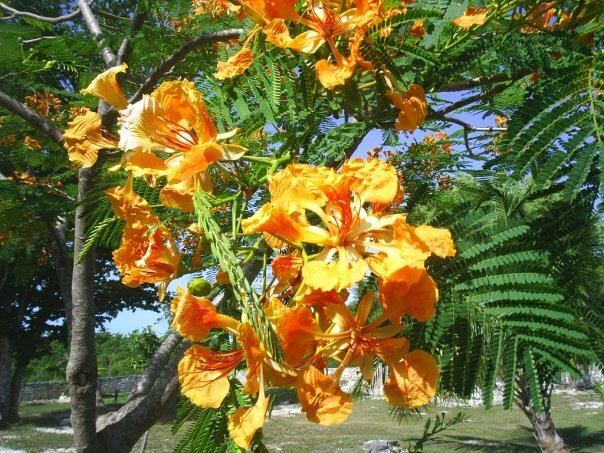 Many of us living in Turks and Caicos would recognize the Flamboyant or Royal Poinciana, Delonix Regia. Locally known as the Flame Tree for good reason; with it’s fiery crimson colored masses of flowers in full bloom, this stop in your tracks striking tree is highly conspicuous. But it’s yellow flowering sisters, the Golden Poinciana, Delonix Regia var. Golden, and Yellow Poinciana, Delonix Regia var. Flavida are far more rare. Delonix Regia originated in Madagascar’s dry deciduous forests but it’s great beauty soon had it spreading to any tropical or subtropical region that could sustain it. In the Caribbean one should begin to see blooms in May, lasting through to September. The rest of the year the tree is a far cry from it’s former glory, looking rather gaunt but easily recognizable with it’s grey smooth branches forming a natural umbrella canopy, feathery fern or mimosa looking leaves, and relatively large, long dark seedpods. I caught sight of a Yellow Poinciana while doing a site visit at a clients in 2010, the first and last I have ever seen locally. Above you can see a comparison between the Royal on the right to the Yellow on the left. Incredible how overpowering the blooms are on the Royal, and how sparse they are on the Yellow, despite the two trees being approximately the same height and likely planted at the same time and maintained in the same fashion. 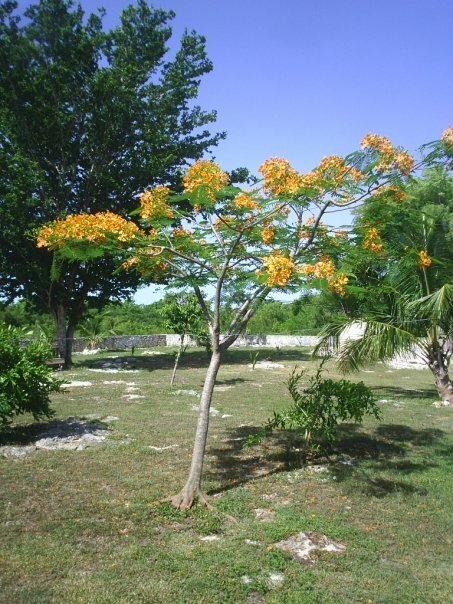 This entry was posted in Caribbean, Field Guide Friday, flame tree, flora, flower, gold, local, poinciana, tree, Turks and Caicos, Turks and Caicos Islands, yellow on February 22, 2013 by pepperkeystacie@gmail.com. It has been far too long since I posted in field-guide-fridays! I have a project at hand to create signage for the longbay-beach-barn nature trail and the decision of which sign to make first was simple. If there is only one species you should recognize and remember, this species would be it! 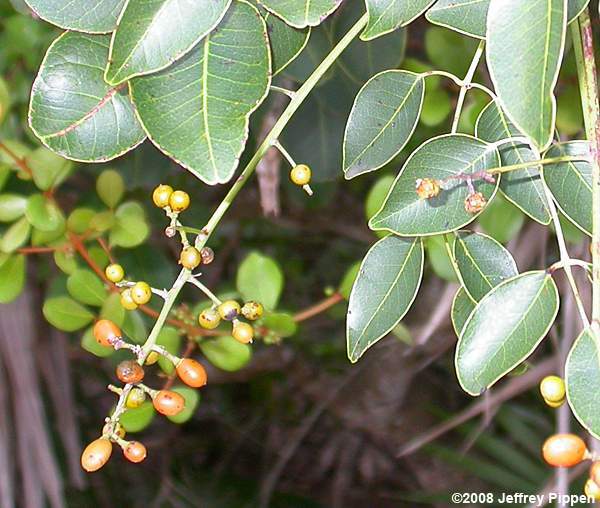 Locally known as Poisonwood, the Metopium Toxiferum species is one you should go to great lengths to avoid in the Turks and Caicos Islands! A member of the cashew or sumac family (Anacardiaceae), the urushiol the plant produces is a severe skin irritant. First sign completed! I hope to identify and label a dozen prominent indigenous species so trail hikers and Provo Ponies horseback riders can familiarize themselves with our beautiful bush! In the meantime, you will want to steer clear of this species after reading the below excerpt (and photo) from sfrc.ufl.edu. 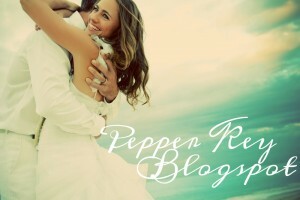 “Its range in tropical America extends from Florida to the Bahamas, Honduras, and the West Indies. irritations after skin contact. 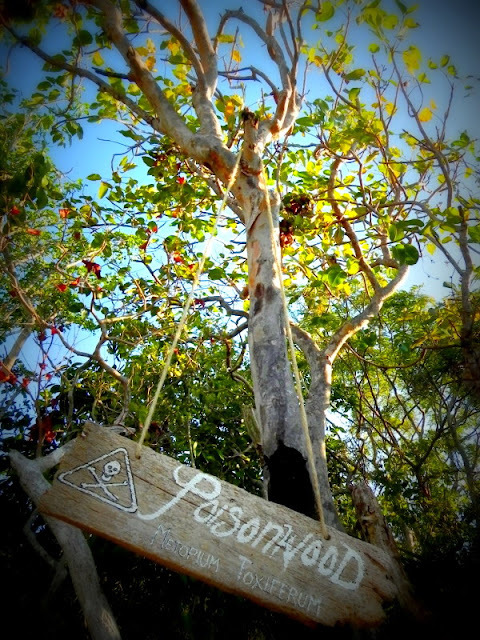 Any part of the tree may carry the sap so handling any part of the poisonwood should be avoided. 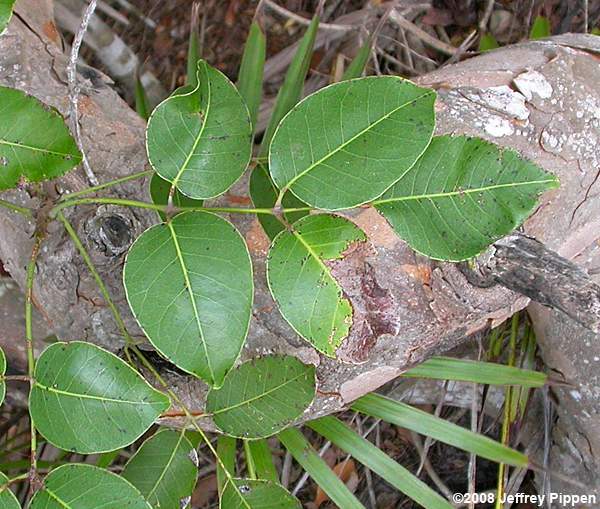 If you live or work in south Florida the ability to recognize and identify poisonwood is beneficial. You can find poisonwood inhabiting hammocks, pinelands, and sandy dunes near salt water. Poisonwood is an evergreen shrub or medium tree that reaches heights of 25′ to 35′ or taller. It characteristically has a short trunk with stout arching limbs and drooping branches that form a spreading, rounded crown. Poisonwood is often a shrub in the pinelands and a larger tree in the hammocks. The leaves are odd-pinnately compound, alternately arranged, 6″ to 10″ long, and have 3 to 7, usually 5 leaflets. Each leaflet is 3″ to 4″ long by 2″ to 3″ wide and broadest near the base or middle. 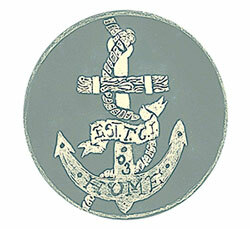 The oval to elliptical leaflets have smooth, glossy, dark green upper surfaces and are paler underneath. The leaf stem is smooth or finely hairy and swollen at the base. The leaflet base is wedged, rounded, or heart-shaped and the tip is acute or rounded. In addition to its leathery appearance, the leaflet has a margin that is thickened, slightly curled, and entire. Many leaflets will be blotched with irregular spots of black resin. The fruit is a yellow-orange drupe that is about ½” long. The fruit hangs loosely in clusters and each drupe contains one, ¼”, hard, brown seed. 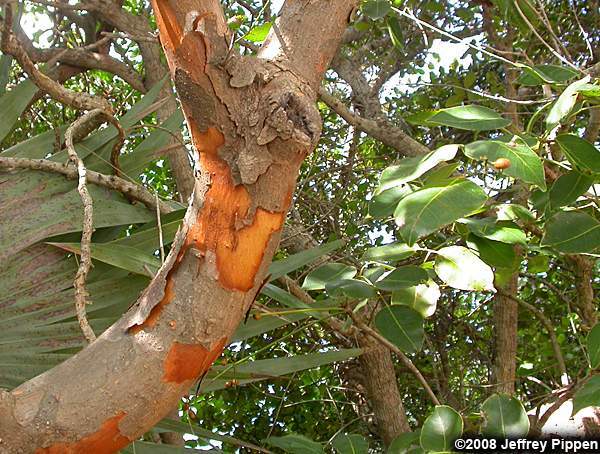 The reddish-brown or gray bark is thin and has dark, oily patches from the gummy sap. Older trunks have scaly bark. Poisonwood grows near salt water on shorelines and in sandy dunes, tropical and coastal hammocks, and rockland pinelands. This entry was posted in environment, Field Guide Friday, flora, indigenous, plant species, poisonwood, Turks and Caicos Islands on May 4, 2012 by pepperkeystacie@gmail.com. Last week on a morning rubbish run, we caught a flash of scarlet in the bush just off the side of the road. Upon closer investigation we saw what looked to be a very small shrub heavy with ripe, bulbous fruits. We took one that had fallen to the ground home to open it up, not convinced that we had ourselves an actual pomegranate. Sure enough, this scraggly looking little shrub was indeed producing beautiful, perfectly formed, super-fruits. But the pomegranate trend, thanks to its natural abundance of antioxidents, is actually not so recently fashionable. Some believe that Eve herself, at the beginning of time, may just have been lured by the Chinese Apple. “The name pomegranate derives from medieval Latin pōmum “apple” and grānātum “seeded”. This has influenced the common name for pomegranate in many languages (e.g. Granatapfel or Grenadine in german, grenade in french). Mālum grānātus, using the classical Latin word for apple, gives rise to the Italian name melograno, or less commonly melagrana. Perhaps stemming from the old French word for the fruit, pomme-grenade, the pomegranate was known in early English as “apple of Grenada”—a term which today survives only in heraldic blazons. This is a folk etymology, confusing Latin granatus with the name of the Spanish city of Granada, which derives from Arabic. The genus name Punica refers to the Phoenicians, who were active in broadening its cultivation, partly for religious reasons. Garnet comes from Old French grenat by metathesis, from Medieval Latin granatum, here used in a a different meaning: “of a dark red color”. This meaning perhaps originated from pomum granatum because of the color of pomegranate pulp, or from granum in the sense of “red dye, cochineal”. After reading the above could you have guessed that Grenadine, the ruby red syrup frequently found in cocktails, originally was made with pomegranate juice﻿, and not high fructose corn syrup as most processed foods are today? Punica Granatum, or the wild pomegranate, may or may not have been picked by the biblical Eve but it has been cutivated since ancient times; revered for it’s great beauty and used often as a symbol of abundance and fertility. With seeds ranging from 200-1400 per pomegranate, no wonder! A common marital ritual in Asia was to shatter the fruits upon the honeymoon suite floor, sending seads in every direction and thus ensuring many offspring for the newlyweds. To read much more on the fascinating history of the pomegranate, from it’s culinary and medicinal uses, to it’s symbolism in Ancient Egypt, Greece, and Persia and significance to Christian, Judaism, Hindu, Chinese, Islam, Armenian, and Azerbaijan cultures and religions, please visit wikipedia. This entry was posted in Field Guide Friday, flora, fruit, Turks and Caicos Islands on February 10, 2012 by pepperkeystacie@gmail.com.